The classrooms are basic at the Liuku Bible Training Centre in China’s Yunnan Province. Beat-up desks piled high with Bibles and hymn books and notebooks, straight-back chairs or stools, blackboard and chalk. Most students had a modicum of Chinese writing ability from their years in state education but could read and write Lisu, their native language, quite poorly when they arrived at the training centre. Only large ethnic groups within China, such as the Tibetans and the Uighurs, have bilingual education provided by the state; the Lisu do not have this, so it is only in church—singing songs and reading the Bible—that most Lisu read their own language. China’s development has largely escaped the Lisu villages that cling to the mountainsides, where homes are made of woven bamboo and animals still live under the floor, where days and seasons are structured by the agricultural calendar and the church calendar, by planting and harvesting, by Easter and Christmas. It is these villages that converted to Christianity nearly 100 years ago after evangelization efforts from missionaries of the China Inland Mission. It is from these villages that the Bible training centre students come. The Bible training centres are very important (feichang zhongyao), emphasised Jesse, the emeritus head of the Gongshan church. In his estimation, about ten percent of Lisu Christians in Gongshan county attend the two-year course of study (five months each year) offered by the church, but the impact extends far beyond. In government schools, Lisu children learn abstract knowledge taught in Chinese. But this is not all they learn. Schools are also “symbols and manifestations of the state will” that “constantly transmit ideology, mainstream culture, and modern knowledge systems to the local people, even in ethnic minority districts in the most remote and distant border regions” say Hongcheng Shen and Minhui Qian. When Lisu students attend school, they shift from one cultural system to another, from the more practical, experiential knowledge learned at home or in the fields in their mother tongue, to the abstract knowledge gained in the Chinese language at school. But as Shen and Qian emphasised, these two knowledge systems are in an unequal power relationship. The Lisu Bible training centres are a means of balancing this power gap. First, the Lisu Bible training centres promote literacy in the Lisu language. Only large ethnic groups within China, such as the Tibetans and the Uighurs, have bilingual education provided by the state; the Lisu do not have this, so it is only in church—singing songs and reading the Bible—that most Lisu read their own language. The Bible training centres reinforce Lisu literacy, cementing and interiorizing the language in its students, and sending them back to their villages. For an ethnic minority, language is symbolic of ethnic identity, and its loss is tantamount to ethnic extinction. Second, the Bible training centres elevate Lisu cultural knowledge. The state school is a place where an emphasis is laid upon learning Chinese characters, speaking the standard Mandarin dialect, as well as studying subjects such as mathematics, science, and politics, and the underlying message that these subjects, none of which have any place in Lisu culture, are the legitimate and important sources of knowledge. Abstract, national knowledge is affirmed; local, experiential knowledge, while not explicitly rejected, is useless. The Lisu Bible training centres present Lisu knowledge in a school environment, thus legitimising Lisu culture on the Chinese educational playing field. By transmitting Lisu religious and cultural knowledge using the Lisu written and spoken language in a school environment with desks, teachers, blackboards, exams, and books, Lisu culture is elevated. Schools formalise the cultural system to pass on knowledge that is outside of (though not in opposition to) the home. The very existence of schools means—even for those who will never attend them—that their culture is worthy and valuable. Few of Yunnan province’s 26 ethnic minorities operate their own schools; most suffer from the power inequality with state schools that seek to raise them out of their perceived cultural backwardness. Third, the Bible training centres provide for the societal role of the teacher within Lisu culture. Informal teachers are present in every culture. They socialise the young into the norms of culture, with teaching done experientially in the home or in the fields. As long as there are parents or older people, there will be informal teachers. But in addition to informal teachers, Christianity has given the Lisu formal teachers: of the Bible, of Lisu reading and writing, of Lisu Christian hymns. Teachers are respected within Chinese mainstream culture and within Lisu ethnic culture. Thus, a Lisu teacher achieves recognition within and without his ethnic group, in Lisu culture and in Chinese society. 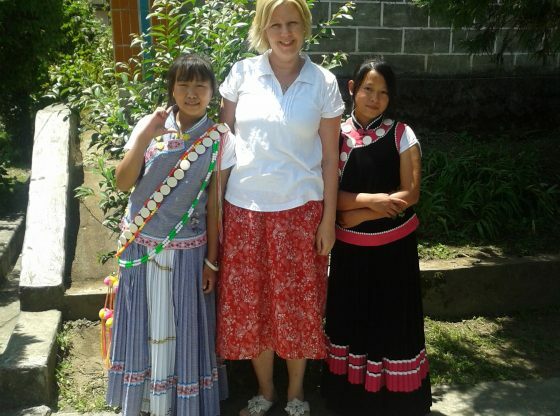 Teachers provide role models within Lisu culture. When an ethnic minority has formal teachers, the young can strive for an educational goal that is still within the bounds of their own language and culture. A minority culture that no longer has a place for teachers is in danger of cultural decay. Finally, the Bible training centres reclaim power and agency by presenting an alternative curriculum to the state education project. Lisu Bible training centres teach Lisu knowledge and thus, they declare that this knowledge is legitimate. Bible training centres are places where Lisu Christianity, language, special history, and music, are affirmed, rather than ignored, as is done in the state school system. The Bible training centres declare that there is an alternative path, an alternative education, and an alternative knowledge-base, than that offered by the Chinese state. The Lisu Bible training centres, as schools, apart from their religious function, serve as a legitimising force for Lisu language and culture. To be socialised into the Chinese state education project is to believe that education is the means for a brighter future, the path for upward mobility. Yet, such education takes place outside of the ethnic culture, and the brighter future envisioned nearly always necessitates leaving the local communities for a big city, for a wage-earning job, for a profession other than farming. Lisu Bible education is the opposite; it trains teachers and leaders whose knowledge is useful in the small churches of the hamlets and villages of the canyon walls. The Lisu Bible training centres are not just spiritual centres, they are a means to cultural empowerment. Aminta Arrington is an Assistant Professor of intercultural studies at John Brown University in Siloam Springs, Arkansas, USA. She tweets @amintaarrington. Image Courtesy: Provided by the writer.